In 1926 artist Montague Black, famous for his work with the White Star Line, created a new piece of art for London Underground. According to the painting in 2026 the city would be dominated by two things: the aeroplane and the “Overground Line.” This might seem remarkably prescient. Black’s Overground though was not run by the trains, but by a form of passenger transport far more remarkable and now practically forgotten by the general public – airships. Black’s painting isn’t the only reminder of this part of London (and indeed Britain’s) transport past. A far more physical one can be found at Cardington, a village just outside Bedford within the London commuter belt. There, two massive airship sheds still stand. Today they play host to a new British airship, the Airlander 10. They were assembled, however, for an even grander scheme to connect London to its Dominions – the Imperial Airship Service, which promised not just to cut ocean crossing times by a half to a third, but also to do so with a degree of grace and ease that few steamships could match. Britain came late to the airship game, only developing larger rigid dirigibles after London had been bombed by Zeppelins starting in May 1915. 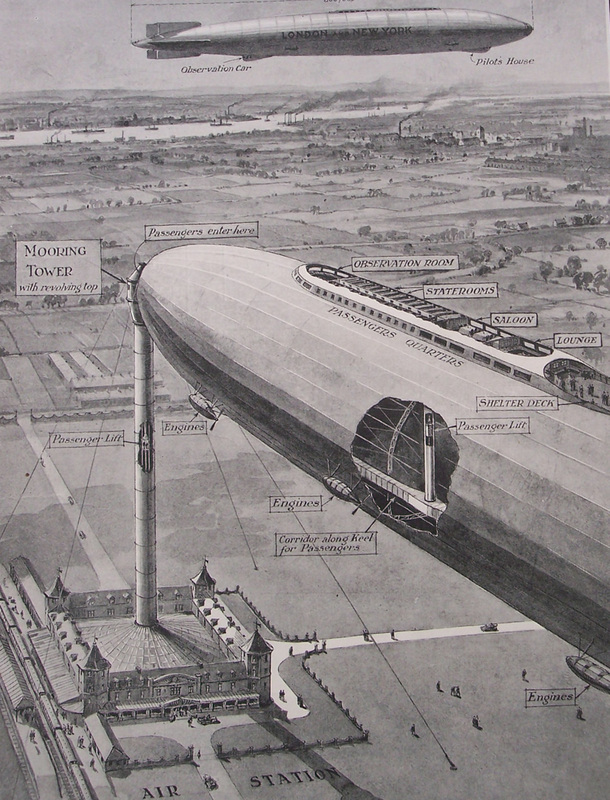 Those attacks highlighted just how effective airships could be and with the threat of even larger Zeppelins on the horizon, the UK Government decided to accelerate its own development plans. This was not to say that there hadn’t been British efforts in this area before the First World War. Small airships funded by wealthy individuals had been built in earlier days and in 1909 Flight Magazine ran an ‘Airships for the Nation’ campaign and some supportive government funding emerged. Even at this stage though this was largely a reaction to German efforts in this area, led by Graf von Zeppelin. 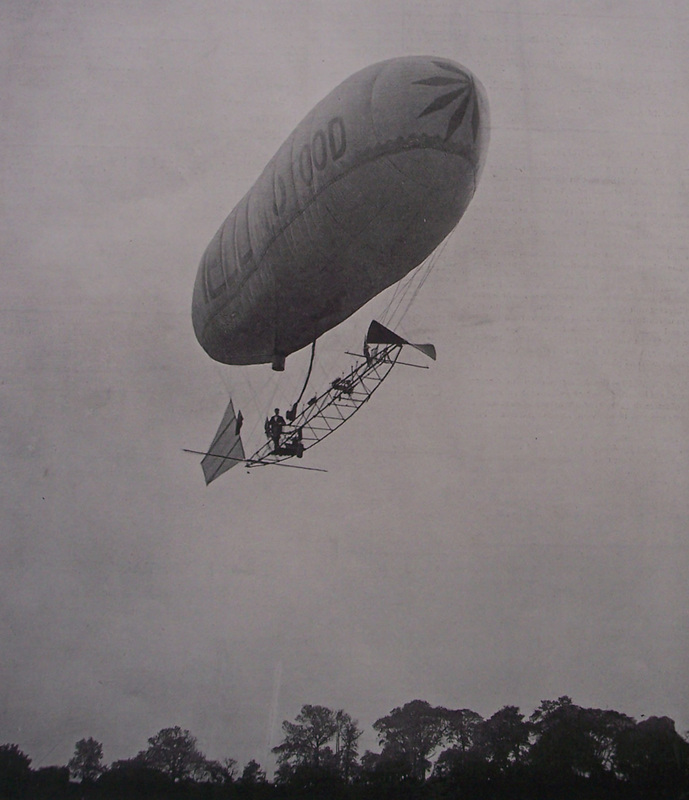 1902 picture of a private airship flown from Crystal Palace to Ealing. Jonathan Roberts’ collection. It was ultimately the war though that pushed British airship development forward and by the Armistice, the Royal Naval Air Service (RNAS) operated 103 dirigibles, albeit all smaller than their rival Zeppelins. Most also had a semi-rigid design rather than the robust German fully-rigid design, which had airbags enclosed in a metal frame (known as a “hull”). 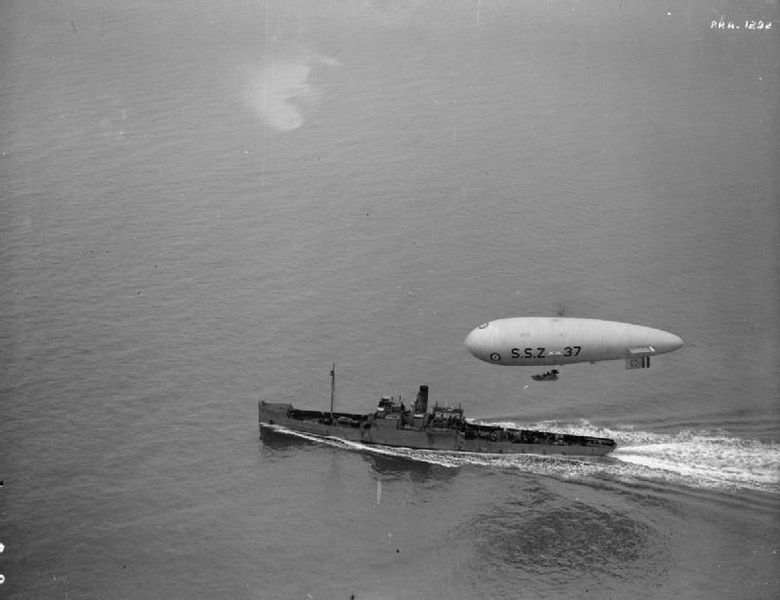 A Royal Navy Airship SSZ 37 flying above a minelaying sloop. One of the main attractions of airships during the war for Germany, Britain, France and Italy had been range. This was perhaps best epitomised by L 59 (Zeppelin works number LZ.104) which undertook the longest airship flight of the whole war. 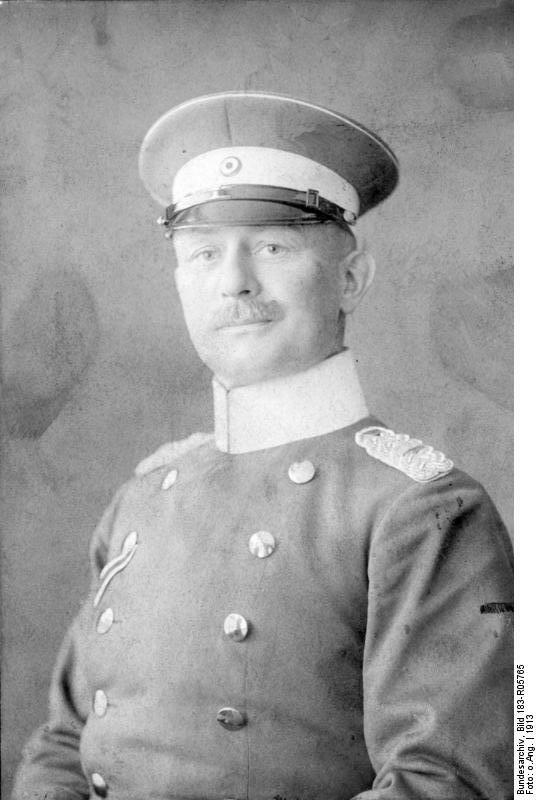 Departing from Bulgaria with critical war items in 1917, it was intended to resupply General von Lettow-Vorbeck in German East Africa, one of Germany’s (if not the war’s) most creative and successful commanders.1 It flew non-stop over the Mediterranean, the Sahara and part of British-controlled Africa, only turning back when it received word that the General had been forced to cede the Zeppelin-friendly flatlands of the colony to the British and withdraw to the mountains. By the end of its unplanned return flight L 59 had flown a total distance of 4,199 miles in 95 hours, a world record 99 years ago and one that remains impressive even now. No commercial airplane could stay aloft that length of time in 2016, except with multiple repeat episodes of in-flight re-fuelling. By comparison the Zeppelin did it with only one extended-range load of fuel. This range was useful in wartime, but was equally useful when peace came, and it was not long before airships were being seen as a possible option for getting from London (and the rest of Europe) to America. The British R.34 (a derivative of the wartime Zeppelin designs, particularly the LZ.76) flew to New York and back in 1919, though the voyage had its difficulties with adverse winds. A Zeppelin (Zeppelin works number LZ.126) was built by Germany for the USA as war reparations and was also flown across the Atlantic in 1924 and giving its name to a popular fox-trot dance song at the time ‘On the ZR-3’. It also carried mail – a valuable revenue earner. By the 1920s the potential for these colossal vessels to become profitable, peacetime long-distance passenger ‘air ships’ was seen as obvious. Indeed Black not including one in his painting would have likely been more controversial than the opposite. In everything from Black’s painting, to hundreds of children’s books and magazines, and many forward-thinking learned articles and books, the skies of the future were lousy with airships. Detailed illustration of possible London airship station, The Sphere, 1919. Note the connecting ‘airship train’ service – similar, one presumes, to an ‘ocean liner train’. Jonathan Roberts’ collection. At the time airships certainly seemed as viable a transport option as aeroplanes. Both had begun development at about the same time, but the latter were small, uncomfortable, unreliable, noisy and, in some cases, extremely draughty. Although faster than dirigibles, aeroplanes had to land every few hours to refuel and had extremely limited passenger and payload capacity, so were not a serious contender to carry dozens of passengers or provide a scheduled mail service on medium or long distance flights. In comparison, dirigibles could fly for days without stopping and carry dozens of passengers and tons of mail and freight in smooth comfort. Airships also offered passengers ocean liner comfort without the sea-sickness and with a shorter journey time. Over land, no train could compare to the stability and calm ride of airship travel, at least in good or average weather. Airships could navigate around most bad weather. By 1924 airships had a cumulative 72 years of airborne operating experience, much accelerated by the war, whilst aeroplanes had only 16 years. Both means of aerial transport had made three Atlantic crossings each, but airships had carried a total of 72 people whilst aeroplanes had carried only six. More importantly, only three Atlantic airship crossings had been attempted and all of them had been successful. The same was not true for aeroplanes, which had a number of fatal failed crossings on their scorecard. Cardington, five miles south east of Bedford, is where the Shorts Brothers Engineering Company, having won a contract for the construction of an airship in 1916, set up their manufactory. The presence of numerous locally-based light engineering companies and a gentle prevailing wind were key reasons for the site’s selection. This airship base was nationalised in 1917 under the Defence of the Realm Act and renamed the Royal Airship Works. Cardington is 44 miles north of Whitehall as the airship flies. Before you reach for your period Bradshaws, there were four weekday trains between St. Pancras and Cardington (changing at Bedford) on the Bedford-Hitchin line, or you could go from Kings Cross to Hitchin and change there. Branch line and fast London connections ranged from good to awful, and the typical journey took 1½ hours to well over 2 hours. As a result for passengers there would likely have been a special airship train (like an ocean liner train service) to Cardington had regular airship services become the norm. Such a journey would have been about 1¼ hours. There was railway freight track right into the Royal Airship Works, which would be ideal for bringing passengers right into the base. Cardington’s airship shed was by far the largest building in Britain at that time, and was large enough to construct and house airships to rival the largest future Zeppelins. This was crucial, as the size and range of an airship was above all limited by the size of the shed it was built in. 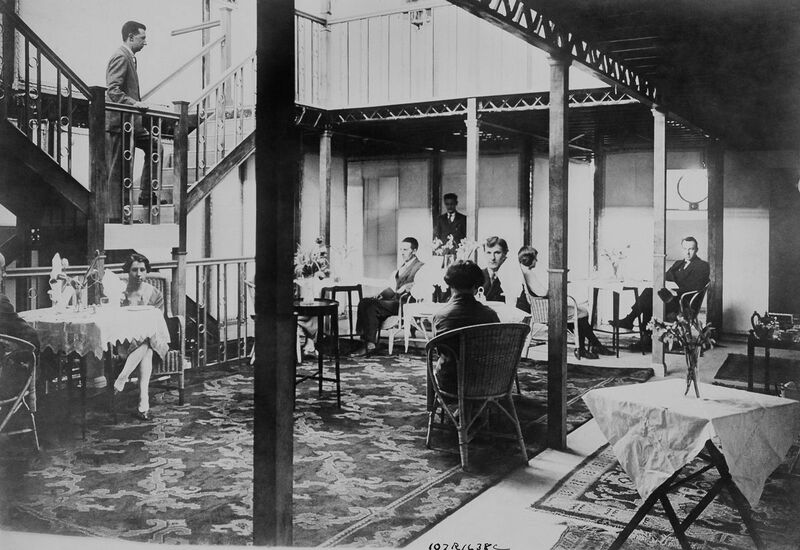 At the 1921 Imperial Conference proposals were tabled for an Imperial Air Service. This would service passenger and mail routes between London and key parts of the Empire – most notably South Africa, India, Australia and New Zealand. The proposal caught the eye of aeronautical engineering firm Vickers. By 1921 Vickers had already dipped their toes into airship design with their R.80 dirigible in November of 1917. R.80 was originally designed in the traditional Zeppelin Zahn shape – cylindrical with streamlined ends – but Chief Designer Barnes Wallis2. soon decided to reshape the envelope of the airship. The result was a constantly curved, streamlined design that massively reduced air resistance. Feeling there was an opportunity there to be taken, in 1922 Vickers and Shell Oil floated an idea to create a company which would build and operate a five airship Empire service for the British government. To begin with, this would fly bi-weekly to India and Australia. The airships would be about 3.8m cubic feet, as large as the Graf Zeppelin LZ.127 that would be built a few years later, with a cruising speed of 55 knots (63 mph). These two companies expected that the service would lose money in its first two years, but then start making a profit once construction costs and depreciation were paid off. In 1923 Vickers formally proposed the plan to the Government. It was rejected, but it planted a seed in politicians’ minds. 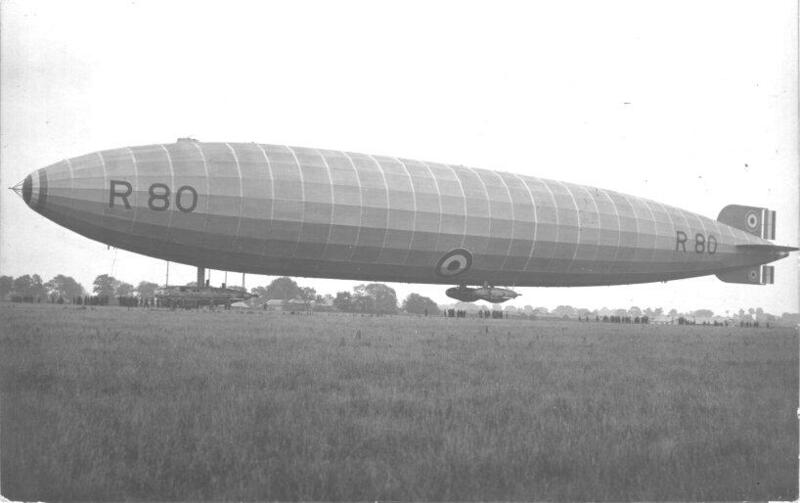 Alongside Vickers’ efforts, the Air Ministry itself had constructed a number of airships. The largest of these was R.38 in 1921, which was part of an export order to the United States (based on the lightweight Zeppelin LZ.96 design). Tragically whilst executing a turn at full speed in calm weather, she broke in two mid-flight and fell to earth, where she then caught fire. The accident resulted in a heavy loss of life and the subsequent inquiry determined that the Air Ministry had not performed any calculations whatsoever of the aerodynamic forces acting on the ship in flight. Rescuers clamber over the wreckage of R.38, courtesy U.S. Naval Historical Center. In turn, the Air Ministry blamed the R.38 disaster on her naval designers. R.38 had originally been destined for uS military service and they had designed the airship to German wartime specifications. Those specifications placed a strong emphasis on keeping overall weight extremely low – necessary in wartime where there was a need to avoid anti-airship fire from ground-based guns, but far less critical once R.38’s role had changed to that of a peacetime craft. None of this should have excused the Air Ministry from performing any structural analysis of the R.38 design, nor from realising that German bombing Zeppelin had very different design needs to a civilian airship.Despite this, none of the Air Ministry officials in charge of developing were disciplined or held accountable in any way. In 1924 Britain elected its first Labour Government, with new Prime Minister Ramsay MacDonald keen to demonstrate the superiority of state run enterprises. One flagship project which soon emerged was the Imperial Airship Service – a new strategic plan for airships to carry passengers, post and parcels on ‘All-Red-Routes’ linking British territories across the Empire, with London as the hub. The requirements were for two airships, larger than any existing or planned dirigibles at that time, to fly with one stop from London to India. Alternatively known as the Imperial Air Communications Scheme, it was also in part seen as a way of binding the Empire more closely together, reduce the isolationist tendencies of some Dominions and keep the Empire commercially competitive with the United States globally. To many, it was the obvious way forward and would demonstrate Britain’s continuing scientific advancement and technical innovation, led by her finest engineers and minds. It was a popular scheme with cross-party support, and development continued even after the Labour government had fallen and the Conservatives returned to power. The endeavour was the largest project of its kind, and its only competition in the mid and late 1920s was from Germany’s smaller Graf Zeppelin LZ.127. This was planned to be the pioneer airship of a new fleet of Zeppelins which would be larger still (these eventually appeared in the mid-1930s as the Hindenburg and Graf Zeppelin II). Construction began on the LZ.127 Graf Zeppelin in the mid-1920s, after the delivery of the LZ.126 to the United States. This was the first German airship to be constructed without risk of prohibition or enforced seizure by the Allies for reparations after WW1 (LZ.120 and 121 were seized, and 122-125 were prevented from being constructed). 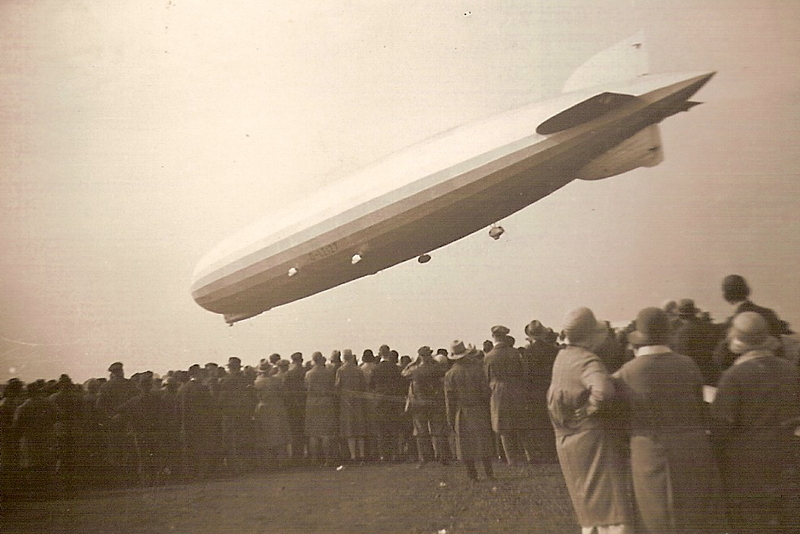 Nevertheless the Graf Zeppelin was delayed by funding difficulties. In August 1929, sponsored by William Randolph Hearst the US media magnate, she made the first around the globe airship flight between New York City (Lakehurst airfield is actually in New Jersey), Friedrichshafen, Tokyo via the USSR, Los Angeles and returning to New York City. There were also start and finish flights from Friedrichshafen to New York, and return. 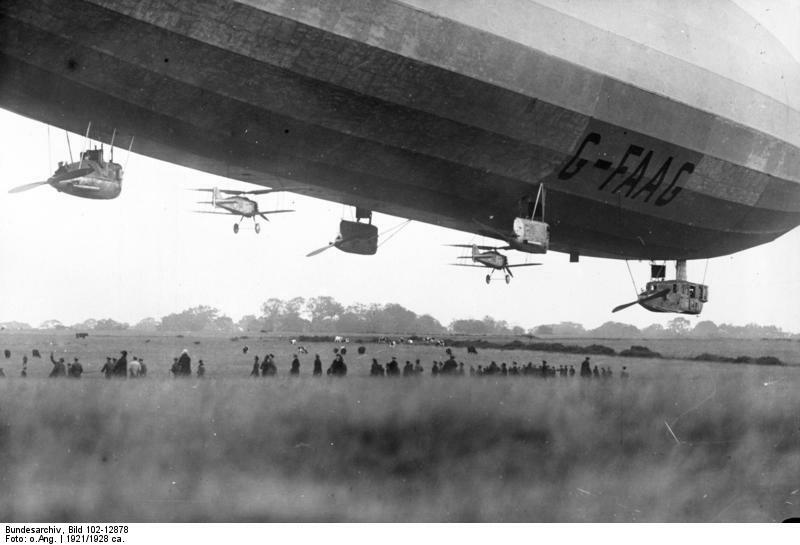 Graf Zeppelin’s development and global circumnavigation may have been much publicised, but Britain was set to leapfrog Germany in the airship race. Not until the Hindenburg and Graf Zeppelin II seven years later would Germany construct passenger airships of similar size, range and carrying capacity to the planned British Imperial Airship fleet. Part of thinking behind the Imperial specification was for the airships to carry 200 soldiers and kit over long distance (though likely not over intercontinental range given their 30 ton weight limit) in case of war. Alternatively the airships could become aerial platforms for four or five biplane fighters for home defence, carried up to 15,000 feet and released to intercept enemy bombers off the coast. This was based upon plans for the R.33 to carry a parasite fighter, which was trialled a year later with a small De Havilland D H 53 Hummingbird. The Hummingbird was successfully launched and retrieved. Full size RAF Gloster Grebes were then launched from the R.33, and returned to airfields. The Cabinet Committee appointed to investigate the airship scheme determined that this would be an ideal competition between state and private industry, so they let concurrent contracts for the private sector. Vickers were to design and construct the R.100, with the Air Ministry at the Royal Airship Works at Cardington designing and building the R.101 to the same specification. It was also felt by the Cabinet Committee that having two competing prototype designs would lead to twice the level of innovation. In general, these airships were planned to be larger and more innovative than any existing airship. a cruise speed of 63 mph (55 knots/101 kmh) and maximum speed of 70 mph (61 knots/110 kmh). This would result in airships with the capability to fly from Cardington to India in six days, Australia in ten (both journeys with refuelling stops), and Canada non-stop in three. The R.100 and R.101 each had an initial budget of £350,000 (about £21m at 2015 values), but the overall budget including research, infrastructure and flight testing was £2.4m (£145m today). Airships of 5m cubic feet of gas capacity, and approximately 735ft long, were calculated to satisfy these requirements. To put into perspective, this is only slightly shorter than One Canada Square at Canary Wharf turned on its side and longer than three A380s. Neither Vickers nor the Royal Airship Works were deterred by the then-recent airship disasters of the R.38, France’s Dixmude (lost in a thunderstorm, originally the German LZ.114), or Italy’s Roma (the world’s largest semi-rigid airship at 1.2m cu.ft., which had been sold to the US Navy and crashed during testing). Both British design bureaus believed that these disasters could have been prevented with better designs and that hydrogen airship travel could be made essentially safe. Both the R.100 and R.101 were almost identically streamlined. They used the same principles as R.80, with long pointed tails shaped like a teardrop for maximum aerodynamic efficiency. Both ships also incorporated their passenger compartments within the airship itself. Combined, these innovations made them the most aerodynamic airships constructed to date. 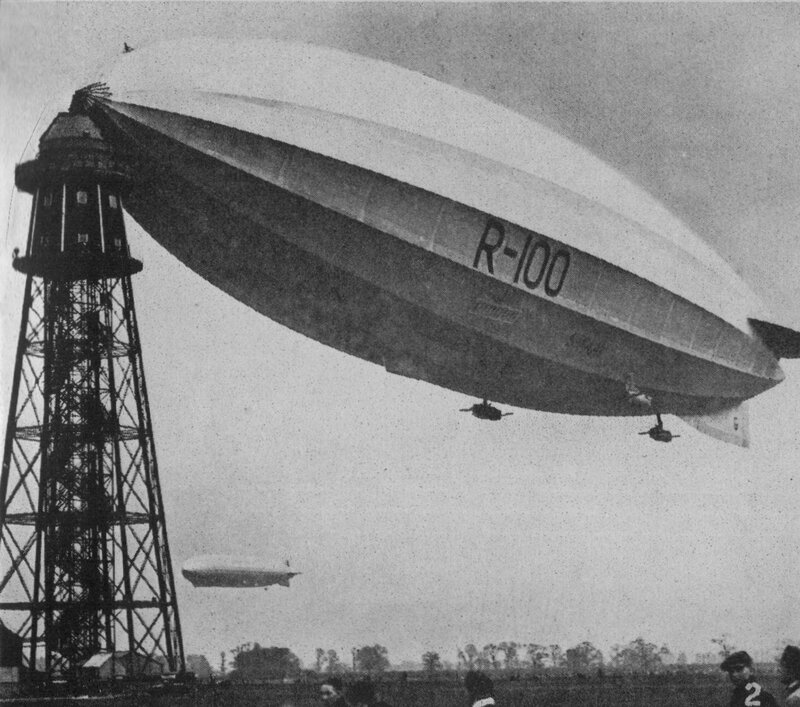 R-100 moored at Cardington in 1930, with the Graf Zeppelin circling in the background. Both ships went with internal passenger and crew accommodations for a number of reasons. The original Zeppelin style gondola slung under the hull limited the configuration to a long narrow space. Moving the passenger area internally allowed a much more spacious layout, created less aerodynamic drag, and reduced the effect of passenger movement on the trim of the ship. The disadvantage was the loss of approximately 100,000 cubic feet for gas, but on the long voyages for which these ships were designed this was more than counteracted by the reduced drag and consequent fuel requirements. On each airship, an internal gangway extended from near the nose, where the passengers boarded, along the bottom of the hull to the passenger and crew accommodations, to the fins, to the very tail where a lookout position was placed. In addition there was a two man winching position at the very tip of the nose, with a bow lookout 20 feet back to oversee the mooring approach and process. A ladder up the centre of the ship opened to a hatch to allow access to the top of the hull, from whence sextant navigation sightings were made. A general issue with airships of that era was how best to compensate for the weight of engine fuel consumed during flight. To maintain the ship’s equilibrium as the ship becomes lighter, traditionally lifting gas was vented (ie wasted). The Graf Zeppelin used ‘blaugaz’ for fuel, chemically similar to coal gas. It was non-explosive, and because it weighed approximately the same as air, burning it and replacing its volume with air did not lighten the airship. An elegant Imperial solution incorporated into both ships was a rainwater collection system along the top of the hull. This accumulated water ballast to compensate for the loss of weight of the consumed fuel, keeping the weight of the ship constant, and preserving the hydrogen. To help avoid potentially dangerous storms, both ships’ control cabs were equipped with the latest radios to receive weather forecasts and conditions. They also both carried an experienced meteorologist on board and their higher maximum speeds gave them more ability to avoid bad weather. Telegraphs, and speaking tubes in case of electrical failure, , connected the control car to the engines and other positions within the ship. Dirigibles contained very large gas cell bags, each made from goldbeater skin painstakingly sewn together from the intestines of 50,000 cattle by a Zeppelin subsidiary in Germany. Goldbeater skins had been a major strategic material for Germany during the Great War, to the extent that occupied territories in Poland, and northern France, as well as the citizens of Austria, had been banned from making sausages so that the skins would be available for Zeppelin manufacture. The gas bags unfortunately absorbed moisture quite readily, which weakened them and made them susceptible to rip if exposed to the wind by a break in the cover. Safety was designed into both airships, in the form of gas bag valves and internal wiring to hold the gas bags securely in place. Shifting of airbags in turbulent air greatly magnified flight trim and control problems. 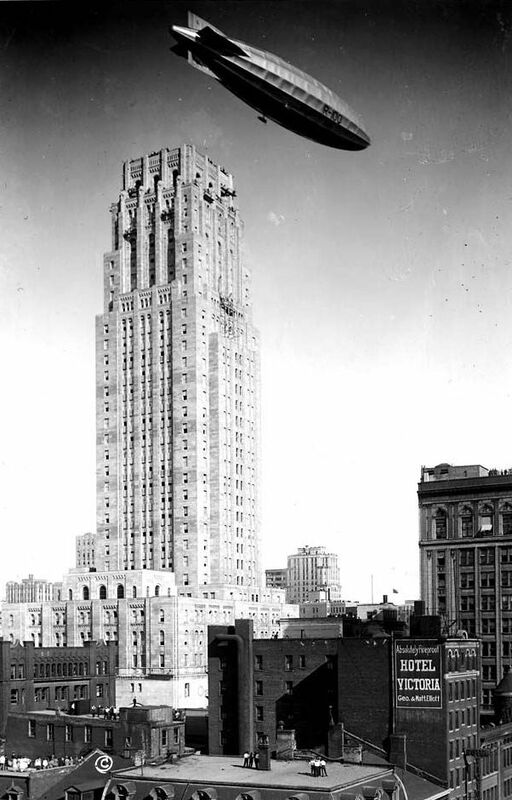 R.100 over the Canadian Bank of Commerce building in Toronto in 1930, then the largest building in the Empire. Courtesy City of Toronto. Pressure relief valves were fitted to the gasbags of each dirigible to deal with unexpectedly large rates of ascent, set at 2,500 feet per minute, such as might be experienced near a thunderstorm. 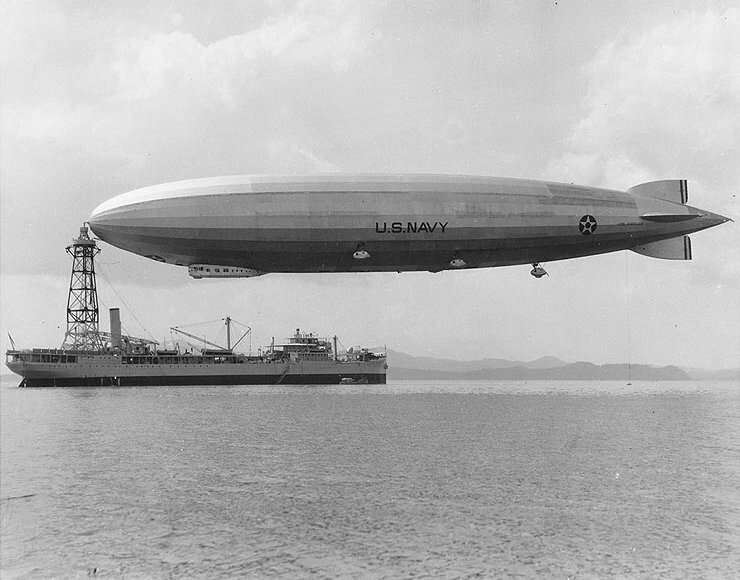 The impetus for this was the loss of the airship USS Shenandoah in such a storm in September 1925. This was a US-built airship using a strengthened version of the lightweight LZ.96 design, with German technical assistance, and operational from 1923. Its last flight had been insisted on by the Navy Department for promotional purposes, despite the poor weather anticipated. Gas bags were ruptured by excessively fast height gain, and there was also a major hull structure failure. In the wake of the R.38 disaster in 1921, the Air Ministry Inspectorate introduced new rules for airship safety in 1924. These required extensive stress calculations to be performed on the ship’s structure, rather than relying on empirical data as was the Zeppelin practice. A subsequent effect was that both R.100 and R.101 had fewer longitudinal girders to simplify the stress calculations, thereby making the structure lighter as well. The stress calculations performed by both design teams are remarkably close to modern practice. To house and build the new fleet, Cardington No. 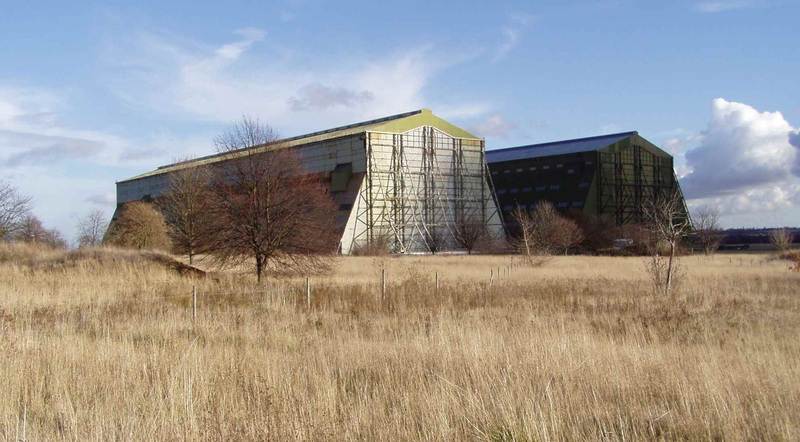 1 Shed was lengthened in 1927 by 10m (30ft), and the shed from H.M. Airship Station, Pulham3., was dismantled in 1927 and re-erected at Cardington as No. 2 Shed, with additional sections added to make it as long as No. 1 Shed. 3. In it’s heyday RNAS Pulham was a major Airship station in its own right, complete with Hydrogen plant. The Royal Airship Works itself was expanded to include a hydrogen plant, foundry, rolling mill and factory to manufacture duralumin alloy. The Meteorological Office established a Research and Forecasting Station there as well to track and predict weather conditions on the main Empire routes. 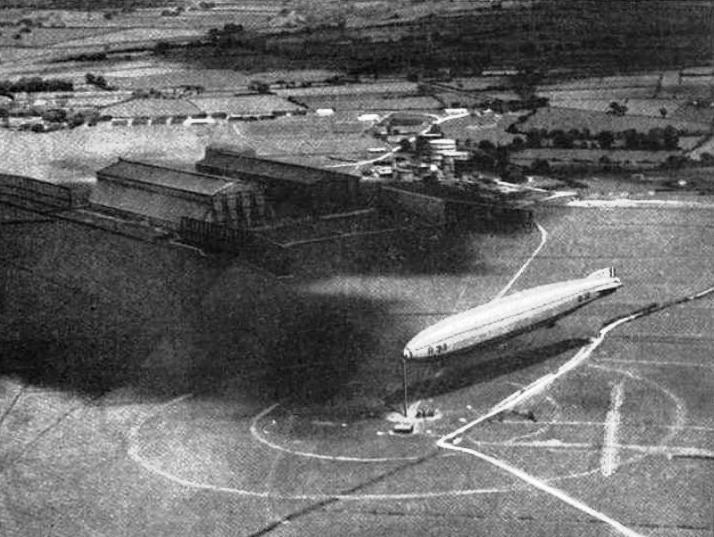 Cardington also became home to one of the most innovative docking technologies of the airship age. For the first time, an airship mast was developed to resist a pull of 30 tons in any direction, obviating the need for very large ground handling parties to bring a dirigible in to land. The 200ft high mast also contained a passenger lift which could accommodate twelve passengers at a time, as befitted the distinguished passengers expected. The Royal Airship Works mast was completed in 1926. In the next part of this series we will look at the construction of the two airships in detail as well as their flights (planned and actual) between London and the world. My Firefox browser has some problems displaying this article correctly – the captions of pictures overlay the paragraph above the picture. Really interesting article – I’ve passed by the Cardington sheds quite often – but seconding the above comment, above each image there is a text overlap making things rather illegible. Not something I’ve been able to emulate. If one of you sends me your screen resolution / browser version and operating system though I’ll happily investigate. Is it coincidence that you published this article the day after the Airlander took its first flight from the Cardinton hangers? Also if anyone is in the area, the Zeppelin Museum in Friedrichshafen is well worth a visit. The successors to some of Zeppelin’s engineering endeavours are still very successful enterprises in the town – MTU was originally set up to make Zeppelin airship engines. It’s owned by Rolls Royce these days and they made the replacement engines for most of the HSTs. Also ZF – the car and truck component manufacturer is a former Zeppelin company, now owned by the town. MTU is also providing at least 250 diesel engines in removable underfloor Powerpacks for the new Intercity Express Programme (IEP) bi-mode trains being built by Hitachi to replace the HSTs. Wonderful article, but I can’t help but point out that it’s a bit misleading to equate Lakehurst NJ as New York City as one might with, say, Giants stadium just across the river from NYC. In fact, Lakehurst is in Southern, not Northern New Jersey, and is a good 80 miles distant from NYC. Lakehurst is closer to Philadelphia as far as large cities go, but still about 50 miles distant. Hmmm. Not a browser/OS combo I have here at home, unfortunately. Have added a couple of lines of css I suspect (on a hunch) might help, but will try and see if I can emulate it in LR Towers tomorrow as well. Potsdam’s tram network still includes a stop named Luftschiffhafen, which translates as Airship Harbour. Presumably this was the Berlin terminal, and so better integrated than Cardington. – the slow readacross in terms of industrial design to other modes – nearly a ten years’ wait before streamlining appeared on trains and trolleybuses (or even aircraft). My understanding of streamlining of automobiles, and by extension buses and trolleybuses, is that it was purely stylistic at the time, part of the Art Deco movement of the 1920s and 1930s, which evolved into the Streamline Moderne movement of the 1930s. At the relatively low speeds at which these vehicles travelled at that time, streamlining provided marginal economies. Vehicle fuel efficiency wasn’t considered that important in the inter-war period – it was only fuel rationing during WWII, and the Oil Shock of the early 1970s, that vehicle fuel economy became much more important. I shan’t get into aircraft streamlining, as is too far off piste. Amazing. I visited the London Transport Museum archive at Acton yesterday, and was fascinated by this poster with the giant airship. Thank you for this. LBM: Not so, or not entirely, the all-time classic of streamlining, as seen in my avatar picture, the Gresley A-4 was entirely functional in its’ streamlining. In wider terms, we are in classic “Steampunk “territory here – expect an invasion from the SF commentariat! A great article and reminder about how technologies at the crossroads or Y-junctions can go one way or another in ways impossible to predict. The concept of the craft shown in the 1919 Sphere illustration with the accommodation up on top is interesting – one would have had very limited views of the ground, but the open air ‘shelter deck’ on the stern (worth zooming in on) would have been out of this world… if at all tenable. In the week of the Airliner 10 being launched, I like to think that there are possible future confluences of technologies that could yet make airships viable for certain purposes: the ‘weaving-in’ of solar cell technology into fabrics to make use of the massive ratio of surface area to motive source being a key one. There may also be ways of making the thrusters more efficient, when one thinks of certain bladeless fans, for instance. Or in another sense, it took developments in information technology to suddenly make it viable to flood London’s streets with the ‘old technology’ of the humble hire bike. So could there still be a place for slower paced, but more energy efficient lighter than air transport. The other interesting ‘forgotten’ transport mode of those times is the seaplane. When one thinks of the issues around finding space for new runways and landing approaches over built up areas, there is a certain logic to be entertained, though I suspect this one will remain confined to a parallel universe, full of optimistic colouring pencils! Right. Have completely rewritten how we do footnotes. Should be a bit better (the earlier method was largely intended to prototype it’s usefulness anyway). If you have any issues because, you know, I’ve just completely recoded a fair chunk of the site at 6am on a Friday, then please email me and let me know what browser you’re using and I’ll fix it. That way we can keep conversation here focused on the article itself. Seriously. A general “It doesn’t work in X” is not useful feedback. I can’t emulate this in any browser on any platform. So it is not a general issue. I’ll need very specific info about the device, resolution and browser (right down to individual version and settings) you’re using for me to investigate. Like I say, email and I’ll take a look. Any further general comments here will thus be deleted, as whilst I appreciate they may be intended to be helpful, unfortunately in reality they’re just noise. Montague B Black was my Great Uncle (“Uncle Monty”, my Mum’s Uncle, one of my Nan’s brothers). … First short test flight of the “Airlander” @ Cardington. Which so-called “Reality” did you order, sir? Thanks for the fascinating article – airship history has been a little pet subject of mine ever since school days and finding out our local church was one of the first buildings to be damaged by one. Keeping with the London connection, a short mention of the Zeppelin Building on Farringdon Rd, which I pass on my regular commute on the 63 bus, might be in order. An excellent article and I wait with great anticipation for the next installment, having read not too long ago the lengthy, but inevitably highly partisan, account of the R100/R101 debacle by the author Nevil Shute. He was chief calculator for the R100, later deputy chief engineer and, after Barnes Wallis moved on to other projects, de facto chief engineer. About one third of his autobiography ‘Slide Rule’ is devoted to the design, build, testing and proving flights of R100, with strong views expressed on the role of the government team. I was told by my grandmother that my mother’s christening was treated to a flypast by the R100, (or possibly the R101) but I can find no record of any flights of either which would have passed over her London home in daylight at any date after her birth in mid-1930. Possibly the R100’s trip to Canada and back passed over London? (The R101’s fatal flight passed over London on a dark wet October evening). (sadly, no-one present at that christening is still alive to corroborate the story). Although it is “common knowledge” that hydrogen was the big hazard with early airships, of the big disasters that killed them off, in only one of them was a hydrogen fire a possible the initial cause. The Dixmude, Shenandoah and Akron (the latter helium filled!) 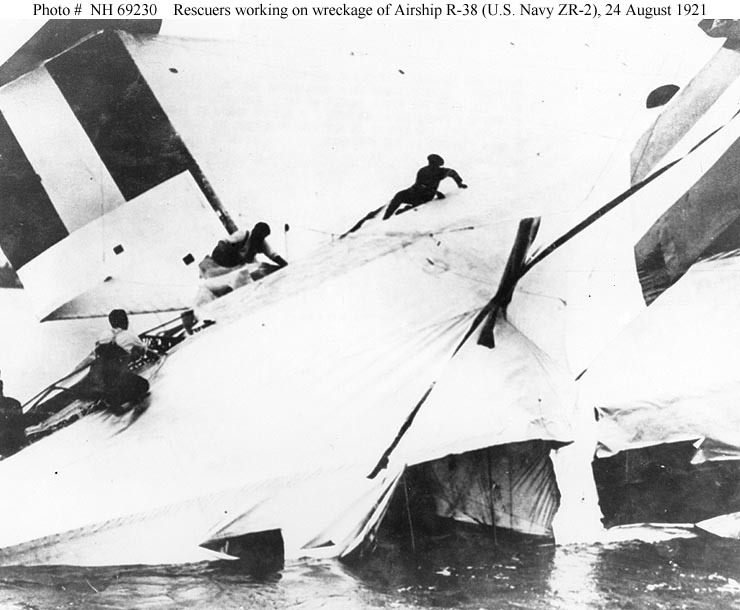 were broken up in flight by windshear, the R101 got waterlogged and crashed. The Hindenberg’s cause is debated, but its inflammable waterproof coating is implicated in some accounts. Hydrogen, unlike jet fuel, floats away, so any fire does not spread very far and most hydrogen fires are survivable if they happen on or near the ground. The Hindenberg was originally designed to use helium but the only source at the time was American and the US Government had banned its export, so it was redesigned to use hydrogen – which, being lighter, required the airship to carry more ballast. A grand piano (albeit made of aluminium) was added to the fittings to entertain the passengers, although it was not carried on the final flight, but had been returned to Bluthner’s factory, where it remained until destroyed in an air raid in 1943. Helium is currently very cheap, being essentially a “by-catch” from natural gas wells, with the US still the largest producer. It used to hold a national reserve but is currently selling it off. However, helium cannot be manufactured, so when it’s gone, it’s gone. This is causing great concern in some fields where helium is essential – such as the superconductors used in MRI scanners – who consider frittering it away in party balloons to be highly irresponsible. The discovery last month of a very large new field in Tanzania may put off the evil day when we have to shut down all the MRI scanners, but there is no way of synthesising the stuff unless we can not only develop nuclear fusion, but harvest the reaction products. Some terminological issues might be helpful here. An aircraft might be either an aeroplane or an aerostat, though these days the term tends to be understood as an aeroplane (as in “the view from the balloon was better than you might see from an aircraft”). An aerostat (not a word in common usage) might be a balloon or an airship, the distinction typically involving the rigidity of the frame and/or the existence of engines. An aeroplane might or might not be a seaplane. A seaplane may be either a flying boat or a floatplane, though sometimes the word seaplane is taken to imply only a floatplane, so the claim “that’s not a seaplane, it’s a flying boat” can be made, but can also be argued-with (not here please). Other pedantic definitions exist, and language is ideally used to converse rather than to argue. Why is this billed as “London” when Cardington is in Bedfordshire? We are considering writing an article on flying boats, so if everyone could hold their comments, it would be much appreciated. Detailed information on flying boats and services in and around London can be sent to [email protected]. Regarding helium and “when it’s gone it’s gone”, it should perhaps be noted that helium released into the atmosphere tends to rise to the “top” (obviously) but also (rather less obviously) tends to escape into space, which is why it would be quite tricky to get it back. As regards topping up the supply, fishing for it in empty space might be “easier” than controlled fusion, but neither technique is terribly close to market-ready! London was primary origin and destination of passengers. Similarly, New York City was the primary destination, even though Zeppelins landed at Lakehurst New Jersey. @Timbeau – according to Shute R100 routed to Canada outbound via Liverpool and on return flew over Gloucestershire on a direct course for Cardington. While he does not say that outbound the route was Cardington – Liverpool direct it would seem unlikely that London featured..
Suitably admonished, and will await part 2 to see if any of the test flights fit the family folklore. Some of the text of the article has been corrupted. As a small bit of irrelevant detail (if you can write about Lakehurst , Friedrichshafen, Tokyo and Cardington in LR, why not?) the Brexit minister David Davis lives in the house in Howden that Barnes Wallis occupied in the 1920s when he was working on the R100. I interviewed Davis for the magazine I then edited in 2000 and we had a lively discussion over public versus private sector projects, as the R100 versus R101 exemplified. He was then head of the Public Accounts Committee, which was berating government IT projects for being late, over budget and often failing. Cardington sounds like a good place to build a replacement for Heathrow. Unfortunately, I can’t get the lid off the tin. This might be a comment for the follow-up article, but I am puzzled by the notion that a direct route back to Cardington involved flying over Gloucestershire. As for ships and modern aircraft, the Great Circle route is the shortest and that seems to mean flying via Scotland, Southern Greenland and Newfoundland. Great article. I love accounts which show that in the past the ideas of what the future would surely hold were quite different to what actually happened and how we now assume history naturally unfolded. Fandroid: Notions of rescue if ditched? It was pioneering, and a more southerly route might have seemed safer. But let’s wait for part 2, shall we? @LBM Streamlining to reduce air resistance was a feature of interwar racing cars and Ettore Bugatti produce the Type 57 car, with aerodynamic bodywork known as the ‘Tank Line’. This won the French Grand prix in 1936. The shape was a bit like the Can Am racers of the 1989s, flat and wide with a sloping front. My understanding is that Sir Nigel Gresley discussed streamlining with Bugatti which is why the A4s have flat sloping front ends in contrast to the Coronations with their rounded shape. But I am not a kettle expert. On a related subject, Nevil Shute Norway was Barnes Wallis’ stress calculator on R100, as described in his autobiography ‘Slide Rule’. David Davis would enjoy Shute’s views on private vs public with R101 the IEP of the skies. And while I am rambling on a Friday afternoon, when Shute founded Airspeed Aviation his partner was A H Tiltman. His name later appeared in the Fare Collection company Cubic Tiltman Langley. 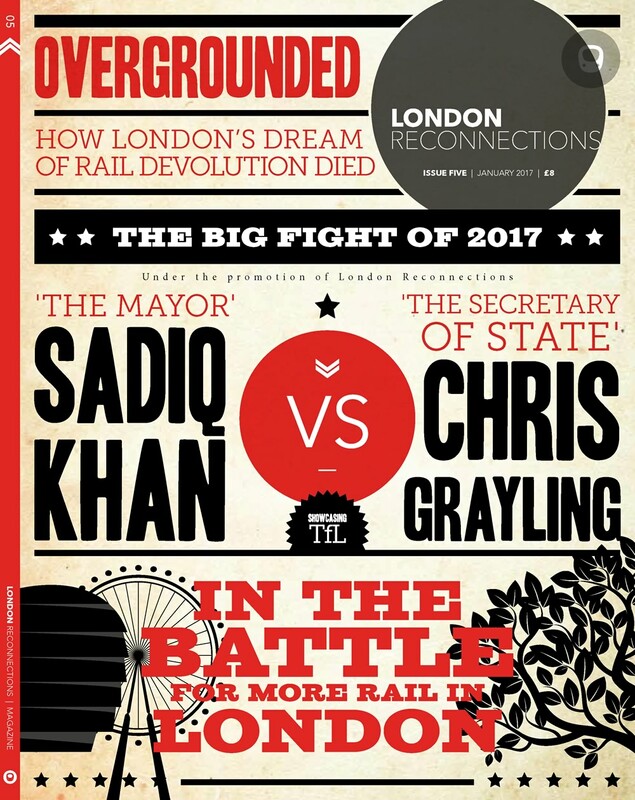 Which brings us back to Oyster and, thus on topic for London reconnections. Possibly the best article on LR. Thank you. the airship has “Overland Line” on its body. There is some indistinct lettering on some of the buildings – perhaps the answer is to be found by seeing the poster itself, in its full size glory. I can discern “Gravity Gas Co. Ltd.” on the side of a building, and, to the right and above the red “Underground” sign it might say “Underground to Scotland”. I also note “London Bridge Air Depot” directly under the Overland Line airship, as well as further down and slightly left, written under the “Bovril” building is “Underground to Scotland”. Perchance by pneumatic railway? Thirties streamlining was indeed mainly style, and indeed carried a weight penalty. It could also have the unfortunate effect of causing smoke to cling to the side of the locomotive, making it difficilt to see ahead – apparently a contributory factor in the St John’s accident in 1957. The famous thumbprint in the clay model of the A4 Pacific which turned out to improve matters was a notable exception. Aerodynamics is a complicated subject, but I have read that the pointy noses on modern trains have more effect in smoothing the airflow BEHIND the train, avoiding a partial vacuum dragging on the rear of the train. Maybe a bit like a bulbous bow on a ship ? @timbeau -the aerodynamic tests even at the time suggested that there was no significant efficiency gain until speeds of 100 mph were reached. (And there were better gains from airsmoothing the gaps between the coaches). What is unclear from this article is what the operating speed of airships was in the ’20s. The target schedules listed suggest a commercial speed of 1000 miles a day including putting down for overnight stays -presumably considerably less than 100 mph. When I raised the subject of airsmoothed design and the disconnect between the modishness of airship travel and the apparent lack of streamlining, I was making a point about the delay in applying Art Deco and Moderne design to air travel, rather than the efficiency of streamlining per se. Not until 1933 did we see, for example, the first Moderne trolleybus design – not a mode where streamlining had any efficiency value at all. Even the airship station design was pure Wembley Great Exhibition style (note those corner towers! )at a time when other aspects of architecture and industrial design had already moved on long before (Cf Pevsner’s embarrassment at showing German visitors round the *modern* Shakespeare memorial theatre in Stratford). @Graham H – the contract for the R100 stipulated achievement of a speed of 70mph with a disposable load of 62 tons, but she actually achieved a speed of 81mph. R101 had a max cruising speed of around 62mph. R100 was originally designed and built with a streamlined tail, but during a flight in May 1930 suffered damage to the last 10 feet due to high aerodynamic pressure causing the framework of light girders to collapse. The Cardington team removed 15 feet of the streamlined tail to leave a bluff, rounded stern profile with little effect on performance. @PayingGuest – thanks for that. Is there an easy link for a good-quality repro of the original poster, for close examination? Love the photo of R100 over Commerce Court North (though I guess that the “North” wasn’t needed then). Pity it wasn’t a few years later so they could get a ground level view with a few PCC trams in it for added 1930s deco effect. Artela: If we can have “London Southend” and “London Oxford” airports then I feel “London (Cardington)” is perfectly reasonable! @AlisonW – and quite restrained in fact. During the early ’90s, I represented BRB on RUCATSE (Runway capacity in the SE), which examined options as far afield as Bristol and Bournemouth and Manston in Kent, besides all the usual suspects. The visit to Bristol was marked by the coach containing the visitors breaking down on the runway with a plane due to land in 3 minutes. But who cares about safety anyway? As you might imagine, Bristol was really too far away (and not really convenient for GWML) to offer anything much under 2 hrs transit time, and Bournemouth was wholly remote from an existing rail line (and no, I don’t want to hear that we shouldn’t have closed Castleman’s Corkscrew back in the day; it couldn’t have offered anything reasonable by way of travel times). @Graham H – As you might imagine, Bristol was really too far away (and not really convenient for GWML). Now, if it had been Filton rather than Lulsgate a very different prospect. I agree but it wasn’t offered. I suspect the pack was made up largely of straw men (eg Bournemouth); the trick was to identify the marked card. The panel of experts thought it was Gatwick, but on reflexion I’m not so sure – Luton had fewer drawbacks at the time. An anecdote I read online a long while ago explained that the large RAF base near the town of Carterton in Oxfordshire, was named “Brize Norton” after the nearby village, because “RAF Carterton” would have been too easy to confuse with “RAF Cardington”. Cardington would have been an unlikely entrant on any shortlist for a new airport as (possibly uniquely for an RAF station) it has no runway. There are quite possibly as many (if not more) RAF stations without runways as with – at least up until the most recent round of closures/relocations. Cardington may be unusual in being a flying unit without a runway but if there had been a London Airport (Cardington) any existing runway would have needed comprehensive extension/reconstruction anyway. @timbeau/@Littlejohn – it all depends on how you define a runway. A quick look at satellite photographs shows a grass runway south of the balloon sheds, while at the time of the R100/101 programmes visitors used to fly in and out of Cardington in fixed wing aircraft. As Littlejohn pointed out until not long ago runway-free RAF stations were in the majority. I suspect that may have changed recently due to a technicality. A couple of former RAF stations I have driven past recently (Neatishead and Bampton Castle) have been retitled as Defence Installations. The question of whether there was an existing runway or not didn’t really enter the equation of where to site a future London airport back in the ’70s and ’80s; a greenfield site would have done just as well. Cublington, anyone? Wasn’t Cublington located at RAF Wing – or am I muddled up? @Littlejohn – I understood, but am always open to correction, that Wing and Cublington were different places, and that the latter made it to the final cut by Roskill, but the former didn’t. Foulness (aka Maplin) would be another place where an airport was intended to go where no runway had boldly gone before. Yardley Chase on the Northamptonshire/Buckinghamshire border came from nowhere. “Other, more cynical, commentators maintained the hidden agenda was that it was always going to be Stansted and the whole exercise of naming other potential sites was something of a smoke screen to give the impression that due consideration had been given to all options.” Discuss. With the Mods’ indulgence for a longer than ideal post, as it is important to pin history down when you can. My parents lived in Aylesbury at the time of Roskill and I recall the Bucks Free Press referring to Cublington (Wing). I have done some quick research sans M. Wiki. Action Stations Vol 6 (Bowyer, pub Patrick Stephens) says in the entry under Wing ‘when the Roskill Commission suggested Cublington (alias Wing)….’ and other sources such as the Airfields of Britain Conservation Trust and Bucks County Council similarly use the two names as referring to the same site. The Cublington village website says : ‘The Roskill Commission, established in 1968 by the Labour Government, spent two years making its decision. It never actually came up with one name for the place, so it called its recommended site Wing (Cublington). Wing is a nearby village which had a small wartime airfield. Roskill’s report was published just before Christmas 1970 and for the following four months the word CUBLINGTON was never far from national newspaper headlines’. So to follow Graham H’s point it seems that there was only ever one potential airport although whatever it was called I guess it would have subsumed the villages of both Wing and Cublington and a lot of other places as well. RAF Wing alone would have been far too small. BTW, Roskill was one of the first applications of CBA on a large scale to the location of infrastructure – bold but futile when it came (as with Cublington) to putting a cost and benefit to the demolition of a mediaeval church. The rail access to all these Buckingham shire sites would have been interesting, but way off topic. As a PS, I wonder how advanced were the plans for Milton Keynes at the time and if Roskill knew about them. Would the development of Cublington have been a hindrance to the New Town? @Littlejohn – they may even have been thought to be complementary! I think opinions have been gradually changing through the period 1950 to now as to whether being near a major airport is good or bad. Realisation of the noise nuisance which a large airport with its large jets constitutes has been slow to dawn – indeed there are still many people around who rate the employment and prosperity benefits higher than eardrums (or who believe in the promise of quieter jets tomorrow). As far as I know the full reasons why the then government rejected Roskill’s recommendation of Cublington, and went (for a while) for Maplin have never been definitely established. But I think the then-recent designation of Milton Keynes is likely to have been a factor. Much more likely to have had an effect on Aylesbury or Leighton Buzzard (nearest Station so might have made lots of MK stops an issue) which are far closer??? Wing probably would have saved the most ink if it had happened. Dad (who grew up near by) always refers to the proposal as “Wing”. The irony, of course, is that if Roskill’s recommendations had been implemented in full, whether at Cublington, Maplin or Stansted, we would have had a world class hub airport for a couple of decades now, and one that would have been operating while hub-and-spoke was still the leading business model. A three runway Heathrow would still not be sufficient for a good hub airport (if you still believe in that model) as four runways do seem to be needed for efficiency. With four runways you get two for landing and two for departing, but with three, one of the runways has to be mixed and the net capacity is less than half of two runways each dedicated to one movement. If, of course, you believe that hub-and-spoke has had its day then a third runway at Heathrow is far less useful than another runway elsewhere. Looking forward, London (& UK) needs adequate airport capacity for trade education leisure & diplomacy, as well as family ties. The discussion of Roskill and dodged decisions above reminds me that we are overdue a decision on the back of Davies. A report that Qantas are considering a non stop flight from Australia to London highlights how far we have progressed since the pioneering days discussed in the article. Looking to the future, learning the lessons of the past seems preferable. Some more familiarity with a (to the operators) completely new type of craft. IMHO the sooner Airlander is passed for more general use, the better. The old saying – if you can walk away from a landing, that’s a result. If you can use the plane again, that’s a bonus. It looks as if the cockpit wasn’t designed to be used as landing gear – perhaps a bit of reinforcement of that area would be a good plan. Watching the video, and without knowing the details, it would seem that some kind of arresting mechanism would be in order to secure the Airlander upon touchdown. Such as a small mast with wire to reel in the airship, or an arrestor wire like on aircraft carriers. They will need something to deal with windy conditions, small and portable, so that it can be taken anywhere it needs to land. Which of course goes against its ‘fly anywhere, no infrastructure required’ benefit. to present and future. Won’t say any more yet, I want to wait for the next thrilling instalment !! P.S when do we get next part of Thames Clipper? Thanks to JB for resolving the formatting issues meaning I could actually read this article. Can’t say airships are really “my thing” but there were lots of little nuggets of information that answered questions I had. Not sure I could cope with flights measured in days rather than hours – the boredom factor would be enormous. Pleasantly surprised to see an airship article here (as an sirship fan). Just one correction from me – it was R34 that crossed the Atlantic (there and back) in 1919, not R33. The ‘branch line’ through Cardington was built as a main trunk route by the Midland to reach Kings Cross on the GNR. Though singled in 1911 and reduced to a shuttle it could have been a useful service to a major airport.